Join Road to Hogwarts 3: Marauder's Marathon! Road to Hogwarts 3: Marauder's Marathon! Hope it's not too late to donate. From your parents and your own funds - way to go! GREAT JOB in therapy tonight! You earned this. Keep working and you'll do some walking in your next race. what a great surprise. THANKS! To all you crazy runners. Or fast walkers. Or slow walkers like me. You've got this! Finish strong! To help make everyone equal. So generous!!!! Thank you so much! Trump's horrific white supremacy leads me to want to give more and more and more to EVERYONE involved with the HPA! YOU ARE THE LIGHT! Even though you are SO WRONG about our President, I gladly accept your kind donation. Thanks so much for your generous contribution to a worthy cause! Wishing you all the speed of a snitch in the marathon! Go, go, go HP runners and walkers! Well done. Love to you all because today is Ginny Weasley's Birthday! Finshed my race...helping HPA finish theirs! For my childhood friend and fellow Hogwarts fan! Thanks YOU!!! You wizard rock! Thanks so much for your donation! Every 'all racers' donation inspires me to donate to 'all racers'' as well! Go Potterheads!! :) Special Shout Out to Team #Hufflepuff! Woohoo! Thanks from your Hufflepuff housemate! In honor of the birthdays of Harry Potter and J.K. Rowling. Dedicated to all Marauder's Marathon racers in honor of birthdays for both J.K. Rowling and Harry Potter. Almost as good as Hagrid's cake. THANKS! A GIFT TO EVERYONE IN HONOR OF JK ROWLING'S BIRTHDAY TODAY! AND, of course, HARRY'S BIRTHDAY TOO! Hang in there everyone! You are loved! Thanks for the support and encouragement!! Three cheers for everybody! You can do it! Great idea! Keep on walking! So proud of Miss Reyna and Oswald you both got this! You rockstars! @balihubido Thank you for your support! This race ended 08/17/17 - check out the final activity below. #320 runner. #798 fundraiser. 7th Longest personal run of this race this month. Last walk of the race!! Woohoo! #80 runner. #1331 fundraiser. 10th Longest personal run of this race this month. 2nd Longest personal streak grows to 17 days at 3.13 miles/day. #27 runner. #601 fundraiser. 9th Longest personal run. #1318 runner. #767 fundraiser. 4th Longest personal run of this race. Passed 17 runners. #1251 runner. #844 fundraiser. 4th Longest personal run. Finished in 1251st place. #14 runner. #549 fundraiser. 10th Longest personal run. #152 runner. #185 fundraiser. Longest personal streak grows to 30 days at 4.08 miles/day. #1250 runner. #308 fundraiser. 3rd Longest personal run. Finished in 1250th place. #1249 runner. #1393 fundraiser. Back after 8 days. 2nd Longest personal run. Finished in 1249th place. #194 runner. #835 fundraiser. 4th Longest personal run of this race this month. Extends streak to 6 days. #988 runner. #525 fundraiser. Longest personal streak grows to 13 days at 1.73 miles/day. Longest personal run. #1293 runner. #1123 fundraiser. Back after 6 days. 3rd Longest personal run. Passed 17 runners. #1248 runner. #636 fundraiser. Back after 11 days. 5th Longest personal run. Finished in 1248th place. #1247 runner. #1384 fundraiser. Longest run in race this month. Back after 28 days. Longest personal run. Finished in 1247th place. #781 runner. #637 fundraiser. 8th Longest personal streak grows to 4 days at 1.80 miles/day. #1246 runner. #1227 fundraiser. Finished in 1246th place. #1245 runner. #1106 fundraiser. 2nd Longest personal streak grows to 4 days at 2.03 miles/day. 2nd Longest personal run. Finished in 1245th place. #1330 runner. #1454 fundraiser. Passed 10 runners. #1262 runner. #1227 fundraiser. Passed 21 runners. #583 runner. #45 fundraiser. Longest personal streak grows to 32 days at 1.74 miles/day. #1243 runner. #714 fundraiser. 2nd Longest personal streak grows to 4 days at 5.00 miles/day. 2nd Longest personal run. Finished in 1243rd place. #1242 runner. #879 fundraiser. 7th Longest personal run. #1242 runner. #879 fundraiser. 3rd Longest personal run. Finished in 1242nd place. #283 runner. #107 fundraiser. 7th Longest personal run of this race this month. Longest personal streak grows to 32 days at 2.51 miles/day. #30 runner. #566 fundraiser. 7th Longest personal run of this race this month. #557 runner. #797 fundraiser. 4th Longest personal run of this race this month. #320 runner. #798 fundraiser. 10th Longest personal run. #1241 runner. #1314 fundraiser. Longest personal streak grows to 5 days at 5.29 miles/day. 4th Longest personal run. Finished in 1241st place. #24 runner. #396 fundraiser. 9th Longest personal run. Last ones... I'm going to miss this..
#9 runner. #705 fundraiser. 10th Longest personal run. #117 runner. #523 fundraiser. Longest personal streak grows to 32 days at 4.82 miles/day. #1240 runner. #1118 fundraiser. 8th Longest personal run. Finished in 1240th place. #154 runner. #544 fundraiser. 9th Longest personal run of this race this month. #309 runner. #733 fundraiser. 7th Longest personal run of this race this month. #309 runner. #733 fundraiser. Longest personal streak grows to 32 days at 2.32 miles/day. #1237 runner. #1355 fundraiser. 9th Longest personal streak grows to 5 days at 2.71 miles/day. Longest personal run. #1238 runner. #387 fundraiser. 4th Longest personal run. Finished in 1238th place. #1134 runner. #1512 fundraiser. 5th Longest personal streak grows to 5 days at 2.65 miles/day. #1236 runner. #1015 fundraiser. Longest personal run. #1235 runner. #1029 fundraiser. 8th Longest personal run. Finished in 1235th place. #76 runner. #821 fundraiser. 3rd Longest personal streak grows to 5 days at 2.50 miles/day. #1339 runner. #157 fundraiser. 4th Longest personal run of this race. Passed 13 runners. #1233 runner. #139 fundraiser. Longest personal streak grows to 4 days at 5.55 miles/day. Longest personal run. Finished in 1233rd place. #509 runner. #1007 fundraiser. 5th Longest personal streak grows to 4 days at 2.80 miles/day. 6th Longest personal run. #1242 runner. #1029 fundraiser. 4th Longest personal run of this race this month. Passed 26 runners. #1232 runner. #275 fundraiser. 3rd Longest personal streak grows to 12 days at 2.35 miles/day. Finished in 1232nd place. #87 runner. #6 fundraiser. Longest personal streak grows to 32 days at 5.69 miles/day. #1230 runner. #675 fundraiser. 3rd Longest personal streak grows to 5 days at 2.89 miles/day. 6th Longest personal run. Finished in 1230th place. Walk with Shirley #4. Short version of our usual evening route. #382 runner. #10 fundraiser. 10th Longest personal run. #1298 runner. #1216 fundraiser. Back after 18 days. Longest personal run. Passed 70 runners. #1228 runner. #1252 fundraiser. 4th Longest personal run. Finished in 1228th place. #363 runner. #1267 fundraiser. 6th Longest personal run. #86 runner. #472 fundraiser. 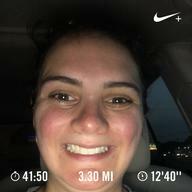 Longest personal streak grows to 32 days at 5.24 miles/day. #208 runner. #319 fundraiser. Longest personal streak grows to 14 days at 5.43 miles/day. #1227 runner. #1242 fundraiser. 7th Longest personal run. #1226 runner. #374 fundraiser. 5th Longest personal run. Finished in 1226th place. 08/17/17 - 6.37 miles, last entry for Road To Hogwarts Marauder's Marathon, 4th Trek (Mile 105.92 - 26.2 of 4th 26.2 + 1 mile) I hit the 26.2 4 times. I should have had more miles in the 31 days provided, but I spent 12 days contributing to the UK National Racery event, and 5 days being sick with only 1 mile entries. It was fun! #25 runner. #67 fundraiser. Longest personal run of this race. 2nd Longest personal streak grows to 123 days at 4.71 miles/day. #1225 runner. #234 fundraiser. Longest personal streak grows to 7 days at 1.20 miles/day. 3rd Longest personal run. Finished in 1225th place. #1224 runner. #1060 fundraiser. 2nd Longest personal run. Finished in 1224th place. #1327 runner. #1365 fundraiser. Passed 4 runners. #66 runner. #702 fundraiser. 3rd Longest personal streak grows to 4 days at 8.26 miles/day. 4th Longest personal run. #1120 runner. #382 fundraiser. 10th Longest personal run. #1223 runner. #453 fundraiser. 10th Longest personal run. Finished in 1223rd place. #1248 runner. #1187 fundraiser. Back after 6 days. Passed 35 runners. #1001 runner. #1081 fundraiser. 3rd Longest personal run. #1222 runner. #1339 fundraiser. Longest personal streak grows to 4 days at 2.10 miles/day. 2nd Longest personal run. Finished in 1222nd place. #236 runner. #508 fundraiser. 6th Longest personal run. #623 runner. #311 fundraiser. Back after 13 days. Longest personal run. #1217 runner. #979 fundraiser. 9th Longest personal run of this race this month. #1218 runner. #1230 fundraiser. 4th Longest personal run of this race this month. Finished in 1218th place. #602 runner. #784 fundraiser. Longest personal streak grows to 32 days at 2.43 miles/day. #1217 runner. #979 fundraiser. Longest personal run. Finished in 1217th place. #1219 runner. #316 fundraiser. Longest personal streak grows to 14 days at 2.68 miles/day. #1216 runner. #1022 fundraiser. Finished in 1216th place. #578 runner. #1389 fundraiser. 3rd Longest personal streak grows to 4 days at 2.32 miles/day. 8th Longest personal run. #1215 runner. #295 fundraiser. Finished in 1215th place. #1214 runner. #376 fundraiser. Longest personal streak grows to 4 days at 2.38 miles/day. 8th Longest personal run. Finished in 1214th place. #1225 runner. #295 fundraiser. Longest personal run. Passed 56 runners. #1213 runner. #1374 fundraiser. Longest personal run. Finished in 1213th place. #1212 runner. #1490 fundraiser. 2nd Longest personal run. Finished in 1212th place.